If you require any more information or have any questions about our website's disclaimer, please feel free to contact us at techlekhak (at) gmail.com. All the information on this website - www.techlekhak.com - is published in good faith and for general information purpose only. It is subject to change without any prior notice. Neither we nor any third parties provide any warranty, guarantee as to the accuracy, timeliness, performance, completeness, correctness or suitability and validity of the information and materials found or offered on this website for any particular purpose. You acknowledge that such information and materials may contain outdated information or may contain inaccuracies or errors and we expressly exclude liability for any such inaccuracies or errors to the full extent permitted by law. Any action you take upon the information or materials you find on this website (TechLekhak), is strictly at your own risk, for which techlekhak.com, nor any of its officers, administrators, owners, directors and employees shall not be liable. It shall be your own responsibility to ensure that any products, services or information available through this website meet your specific requirements. Though we strive to be completely accurate in the information that is presented on our site, and attempt to keep it as up to date as possible, in some cases, some of the information you find on the website may be slightly outdated. 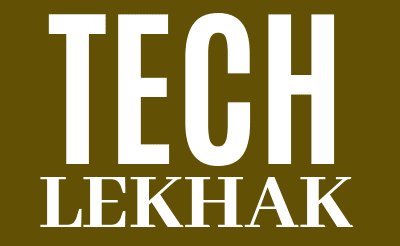 www.techlekhak.com reserves the right to make any modifications or corrections to the information you find on the website at any time without notice. This website contains material which is owned by or licensed to us. This material includes, but is not limited to, the design, layout, look, appearance and graphics. All trademarks reproduced in this website, which are not the property of, or licensed to the operator, are acknowledged on the website. Unauthorized use of this website may give rise to a claim for damages and/or be a criminal offense. While we strive to provide only quality links to useful and ethical websites, we have no control over the content and nature of these sites. These links to other websites do not imply a recommendation for all the content found on these sites. However, once you have used these links to leave our site, you should note that we do not have any control over that other website. Therefore, we cannot be responsible for the protection and privacy of any information which you provide whilst visiting such sites and such sites are not governed by this privacy statement. You should exercise caution and look at the privacy statement applicable to the website in question. We have no direct, indirect, consequential, or incidental responsibility for the content of the linked website(s). Users may find advertising or other content on our Site that link to the sites and services of our partners, suppliers, advertisers, sponsors, licensors and other third parties. We do not control the content or links that appear on these sites and we are not responsible direct, indirect, consequential, or incidental for the practices employed by websites linked to or from our Site. In addition, these sites or services, including their content and links, may be constantly changing. These sites and services may have their own privacy policies. Browsing and interaction on any other website, including websites which have a link to our Site, is subject to that website's own terms and policies.